Around 2,000 people gathered at Westminster Abbey yesterday for a memorial service dedicated to the victims of the Westminster terror attack. On 22 March Khalid Masood killed three people when he drove into crowds and stabbed a policeman to death before being shot dead at the UK Parliament. The service was led by the Dean of Westminster, the Very Reverend John Hall, and was attended by the Royal Family, the Mayor of London, MET Police, faith leaders and survivors of Khalid Masood’s murderous rampage. 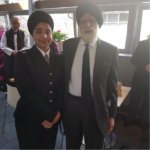 Our Director, Lord Singh attended in his capacity as a faith leader, something he does routinely at civic occasions like the Commonwealth Service and the Remembrance Day Service at the Cenotaph. American tourist Melissa Payne Cochran who lost her husband during the terrorist incident was also in attendance with her parents. She had been celebrating her 25th wedding anniversary with her husband on the day of the terror attack. In a moving tribute to those who had lost their lives, Prince William read a passage from the Bible about the Good Samaritan. The Home Secretary Amber Rudd read from the Book of Jeremiah and PC J Garcha, a serving officer in the MET Police read from the Guru Granth Sahib (Sikh scriptures). Some representatives from the Sikh Federation and Sikh Council were also among audience members.